What does it take to be the best New York City wedding photographer? It’s not just one thing, but a variety of different things that would lead one to become one of the best photographers in New York City. The photographer must be technically proficient. The photographer must be able to beautifully compose a wedding photograph. The photographer must be able to capture beautiful moments, over and over throughout the day. And lastly, the photographer must truly understand New York and what a New York City wedding is like to photograph! First of all, the New York City wedding photographer has to have unparalleled technical ability. That means that the wedding photographer has to excel in all areas of photography, not just wedding photography. The photographer must be able to create a proper exposure, meaning that he or she must be able to assess the light levels in the space, choose a proper shutter speed to freeze or blur the movement, choose an aperture (f-stop) to emphasize depth of field, and combine those two things with an ISO selection. Those three items together make up the exposure, and to be the best New York City wedding photographer, one must always get all three correct, every time he or she clicks the shutter. Whether you’re indoors or outdoors, in bright light or darkness, the photographer has to be able to make a correct decision on f-stop, shutter speed, and ISO. Every single time! That’s thousands of shutter clicks per day, and each one matters. The New York City wedding photographer must also be able to compose an image properly. What does composing properly entail? This means that the photographer has included elements in the image that helps tell the story he or she is attempting to tell. The photograph must include only the elements that help the photographer tell the story of the scene. Are there too many details, distracting the viewer’s eye from the story? Are there too few details, not enabling the viewer to tell what’s going on in the photograph? Unlike other forms of photography, the wedding photographer cannot stop the action at a wedding to re-do or re-frame a composition in real-time. Weddings move quickly, and action at weddings moves extra quickly! 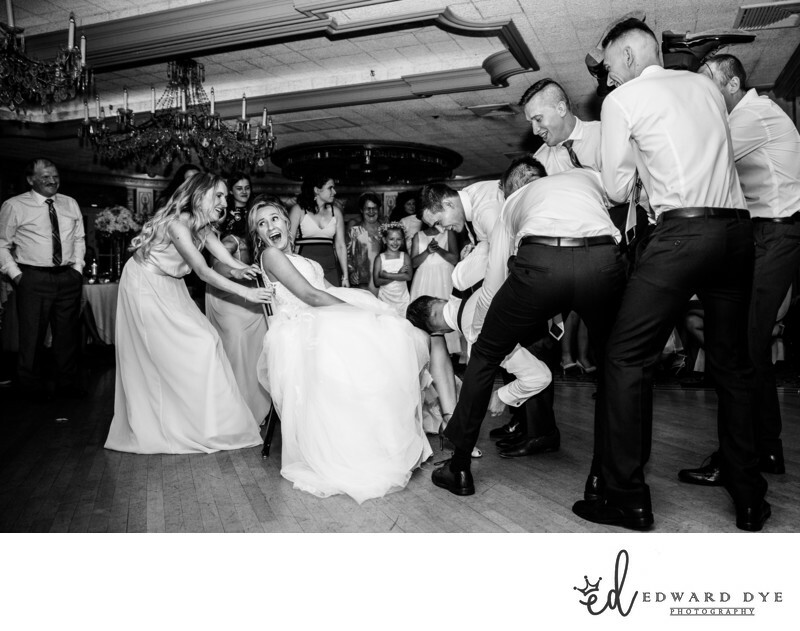 To be the best New York City wedding photographer, one must be able to assess a compositional scenario as quickly as he or she assesses the elements that make up a proper exposure. Even to an untrained eye, it’s easy to tell if a photographer is gifted at the art of photographic composition or not. Take a look at a wedding photograph - this one, perhaps! Does your eye go right to the subject in the frame? Take another look. Where your eye goes firs should be the focal point of the entire image. Is it the subjects’ faces? Is it a wedding bouquet? Is it the rings? The bride’s shoes? The tear trickling down the face of the mother of the bride? If your eye gets lost in the frame, the composition might not be powerful enough to properly tell the story. The best wedding photographer in NYC understands the timing of a wedding day. To be one of the best wedding photographers in NYC, one must truly understand how to help their clients craft a well-formed wedding day timeline. A truly experienced wedding photographer will be able to spot any red flags, such as Not enough time for hair and makeup to be completed before the bride gets dressed. Not enough time allotted for travel between locations. This could be traveling from prep to ceremony, ceremony to cocktail hour, cocktail hour to reception, or between any portrait locations chosen for the day. Not enough time for the family and bridal party list provided to me for the formal photographs. ...and so forth! Another thing that would set apart the best New York City wedding photographer from all the hundreds of other NYC wedding shooters is the ability to capture a moment. This is something that is very hard to learn. Technical skills can be learned through careful education. You can practice and re-practice different lighting scenarios. A photographer can work hard on their usage of off-camera flash, or on-camera flash, or portraits with a video light. Over time, you can hone your technical abilities. It’s very difficult to hone intuition. I truly feel that a photographer can either anticipate a moment and capture it, or he/she cannot. Anticipation, action, and reaction are more difficult to learn. Experience will help with those things, but not as much as a natural ability can. The ability to capture a moment is what makes someone cry over a wedding picture - even when they don’t know a single person in the image! Capturing a moment freezes a second in time so fleeting that it’s almost gone before it even takes place. There are hundreds, if not thousands, of moments to capture at a wedding. The best New York City wedding photographer will strive to capture all of those. Those moments captured will combine with the aforementioned technical ability to create images that truly stand out above the rest. I will never rest in my desire to continue creating better work every single year than I did the year before. I believe that I owe it to my clients to be constantly educating myself, no matter how long I have been in business. Finally, I understand New York. I mentioned before that the best New York City wedding photographer has to have a true understanding of what it’s like to shoot IN New York City! Capturing your best and most timeless memories without disturbing the moment. Keywords: 10001 (777), Best photo wedding (780), best wedding photographer under $5000 (780), Best wedding photographers (780), black and white wedding photography (780), Brooklyn (780), Capturing your timeless memories without disturbing the moment (780), Documentary wedding photographer (780), Edward Dye Photography (777), Elegant wedding photography (780), engagement photographer (780), engagement photography (780), high-end wedding photographer in New York (780), Hudson Valley wedding photographer (780), Huntington wedding photographer (780), LI (780), Long Island wedding photographer (780), Manhattan (780), Natural wedding photography (780), New Jersey wedding photographer (780), new york city (780), New York wedding photographer (780), New York wedding photographer cost (780), new york wedding photographers (780), NJ (780), North Jersey (780), NYC (780), Outdoor wedding photographers (780), packages (780), photographer for wedding (780), photographers for wedding (780), popular wedding photographers in New York (780), pre-wedding photography (780), Professional photography wedding (780), professional wedding photography (780), Queens (780), top wedding photographers in New York (780), Wedding (780), Wedding best pictures (780), Wedding ceremony (780), Wedding day (780), Wedding ideas (780), Wedding photograph (780), Wedding Photographer (780), wedding photographer nyc (780), Wedding photographer pictures (780), Wedding photographers near me (780), wedding photography (780), wedding photography estimate (780), Wedding Photojournalist (780), Wedding planning (780), Wedding reception (780), Wedding shoot (780), Wedding tips (780), Weddings venue. (684).